…there is the distinct feeling that the maximillian sunflowers are about to stage a world takeover. They are great because they explode into bloom at the very tail end of summer/beginning of fall when everything else is swooning from the heat. Another sign that fall is here at last. 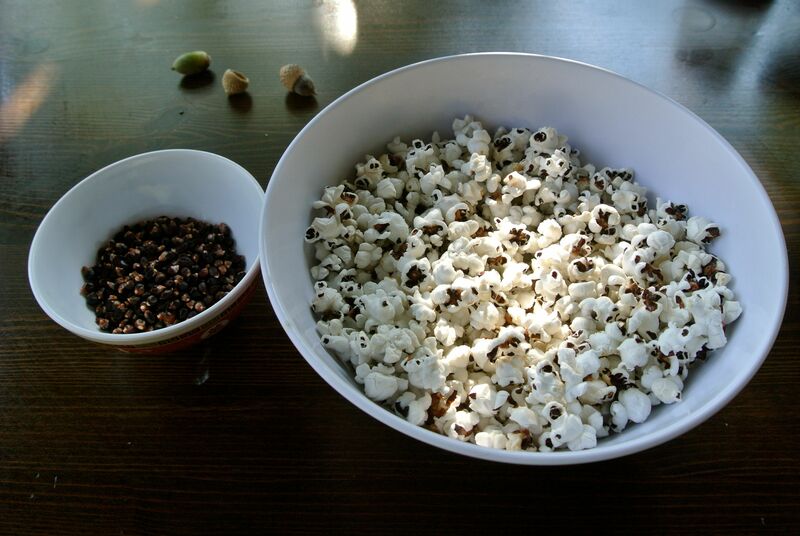 … there is a bowl of popcorn from the garden. Baki and I planted some Dakota Black popping corn and we harvested it a few weeks ago from skeletal, dried out plants. Out of the blue, Baki asked for popcorn this morning right after we ate breakfast, so we tried it out. After much energetic popping, I am pleased to report that it is unbelievably tasty — I swear, it tastes buttery! I like, too, how it looks burnt, but it’s just the hulls and kernels from the corn. … there are quince, ready to be eaten. These might look green and unappetizing, but they are sweet and fragrant once you get them out of their fuzzy peels. Ali picked them from the tree, which was bent almost double under the weight of the fruit, and we’ve eaten plenty of them already. 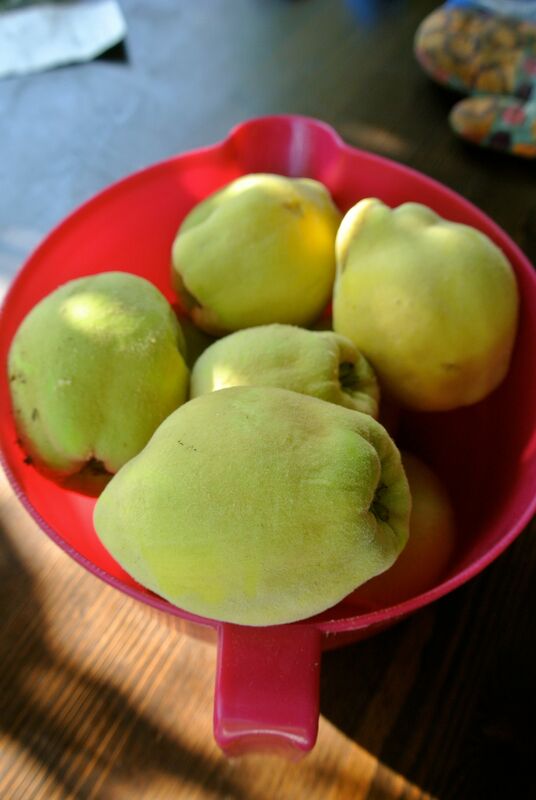 I will be making quince jam this week, and will post the recipe. It’s my mother-in-law’s no-fail easy-peasy pressure-cooker quince jam. So these sights, smells and flavors of fall have gotten me well and fully appraised of the change of seasons. Summer is but a sweaty memory. I’m digging out the wellies and the sweaters. Hooray for fall! I will take a photo this weekend so you can see our jigsaw puzzle houses! I try to get Baki’s hands dirty, but since I wasn’t much of a gardener as a child, I know there’s always time. He liked the popcorn, though. That’s the thing, isn’t it – things taste better out of the garden. We’re laying-up here, too, but we’ve slid into the usual grey, damp English weather that I really find difficult. Long months of this stuff before I see the first green shoots in the garden again. I hope all those preserved flavored of summer see you through the darker months of the year. It is a welcome change — I have been dreaming of sweaters for the past month or so, and I love the smell of a quenched garden! Such a lovely view from your kitchen! This is the first time I have ever heard of eating quince without cooking it with tons of sugar. I love the flowers but hesitated to plant a tree, because I didn’t know what to do with the fruits. (I am diabetic) Now that I know you can eat them RAW I am anxious to plant a tree! The quince look delicious. I vow to bake some this fall. I look forward to seeing the results! 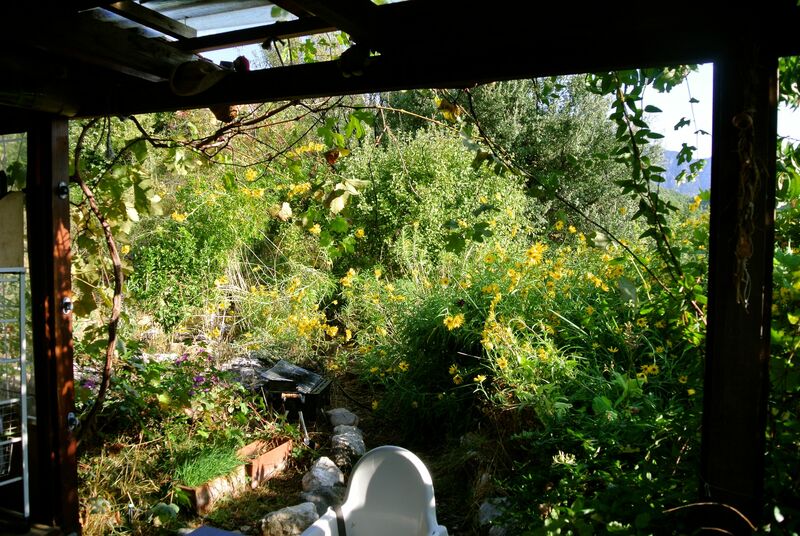 I love your detached kitchen- it has such a lovely view! I grew strawberry popcorn one year and scraped my thumbs raw detaching the kernels from the cob- that black kerneled is very tender if it is anything like the kernels here in the states- how neat that you made up a batch after breakfast! Thanks for sharing – I enjoyed the visit! Thanks for stopping by. I think that strawberry popcorn looks really cute — but now I know its secret. By the time I processed the Dakota Black it was dry and pretty spiky, so I know what you mean about the raw thumb. It was worth it, though! Hi I can’t believe you grow your own popcorn. That is very cool. Thank you! It was actually the only corn that did much of note this year, so I’ve decided that next year it’s popcorn all around! I love the quince as well! I like how quince doesn’t look very inviting, but it is. I would like to try hull-less popcorn –that’s on my “to-plant” list for sure. We are stovetop poppers, too. It’s more fun that way. It is funny, isn’t it, how when there are not as many variations in weather, we become more attuned to the subtler changes in weather. Your kitchen looks like paradise! Yummy yummy. That popcorn looks divine! It was really good. I am definitely planting popcorn again next year!